The internet is abuzz this morning with news that Michael Gove is set to remove popular U.S. texts such as ‘To Kill a Mockingbird’, ‘Of Mice and Men’ and ‘The Crucible’ from Britain’s GCSE English Literature syllabus. To those of us who have been following developments in English closely, this comes as no surprise. Last year I submitted an essay for my M.A. on this very topic: to what extent does the Government’s current ideology of the literature curriculum seek to impose an ‘official culture’? I offer here a highly edited version, which I feel is pertinent to today’s debate. In a nutshell: it’s all about official culture, and that culture does not belong to the ordinary people. Quick PSA before I get started on this. I used to blog TV and sometimes movies over on couchpumpkin. As you can probably tell from the last timestamp on there, I haven’t had time to keep that up on top of this blog and everything else – so I’m going to be doing any media writing on here from now on. I’ve been writing about Mad Men in fits and starts since 2009 – check out the tag to find my other pieces. 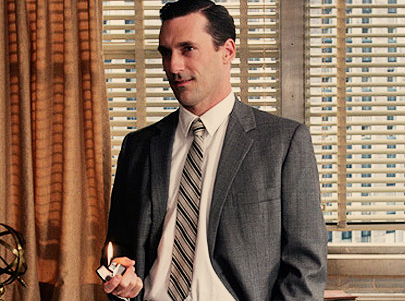 There is so much I want to say to you, Mad Men. How can we have so little time left? A handful of episodes, and a 12-month stretch to divide us. I’m not sure how I’ll manage when you’re gone. Endless rewatches, I’m sure. The fruitless search for something to match you. I finished writing a book. Now what? Last Thursday afternoon, hiding from the rain in a Cafe Nero by Waterloo Bridge, I ‘finished’ the first draft of The Hunt. Of course, the book is far from done – I need to go back and fill in the holes, for a start, when I’ve finally decided what on earth should happen to Amber and where to put in more clues about the Huntsman and lots more spoilery stuff. The first draft is pretty rough right now. The funny thing is, almost everyone I’ve spoken to about it has asked, ‘Well, what are you going to do with it now?’, as if I might send it off to an agent tomorrow. I mean, I *could* send it off, but that would be shooting myself in the foot. Instead of being the end of the writing process, in many ways this is now the beginning – with the rough shape of the story in hand, I can get down to the nitty gritty of polishing. For many writers (including this one!) this is a scary process.